The new transporters are being used for the delivery and collection of cars and vans up to 3.5 tonnes. 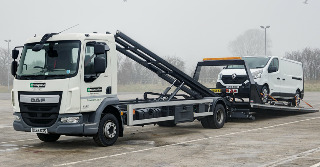 In addition, the Roger Dyson designed transporter bodies on all the new DAFs have been specified with spectacle lifts, allowing for a third vehicle to be towed when required. Enterprise Flex-E-Rent operates over 26,000 vehicles in its fleet, covering cars, vans and HGVs, as well as specialist temperature controlled and accessible vehicles. The fleet is available through 20 depots across England, Scotland and Wales. “Speed is key, especially customers who rely on our services for last-minute replacement and seasonal requirements. Designed for single operator use, our new state-of-the-art vehicle transporter fleet will be based across our UK branch network, which will help us to provide an even faster delivery and collection service to our customers,” said Danny Glynn, managing director, Enterprise Flex-E-Rent.